Christ blesses us with His right hand, His fingers formed into the shape of the Greek letters “IC XC,” the abbreviation in Greek for “Jesus Christ”. He holds in His left arm a jewel-studded Book of the Gospels. 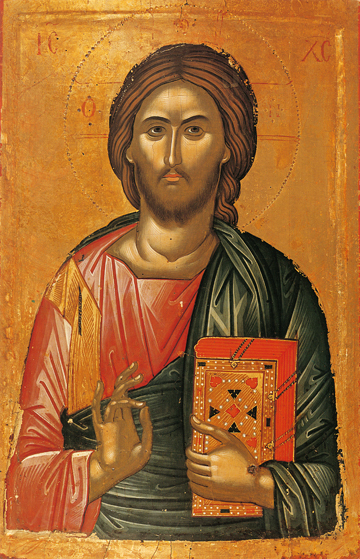 From the prototype of the first icon of Christ, miraculously made by the Saviour Himself, He is traditionally shown with a short beard and having long dark brown hair with reddish highlights, parted in the middle. Christ is shown with an outer blue robe, symbolizing the Humanity that He put on at His Incarnation, and with an inner red robe, representing His Divinity that remains for all eternity. In the cross, in the nimbus or halo around His head, are the Greek letters for “I AM” to remind us that although Incarnate in time, Jesus Christ is God before the ages, even before Abraham, and He is the same God Who spoke with Moses face to face. This icon was painted by the master iconographer Theophanes the Cretan in 1546 and is found with many more of his masterpieces at the Katholikon or main monastery church of Stavronikita Monastery on Mount Athos.